My buddy was coming over and wanted spareribs. I told him I wanted to try Haskap Barbecue Sauce. Think of haskaps as a sour blueberry. He was skeptical and said he likes his ribs spicy. I told him I would make a Sriracha Barbecue Sauce for the ribs and that would have a touch of spice. What I didn’t tell him was I was doing both sauces and was going to do 1/2 the ribs with each. 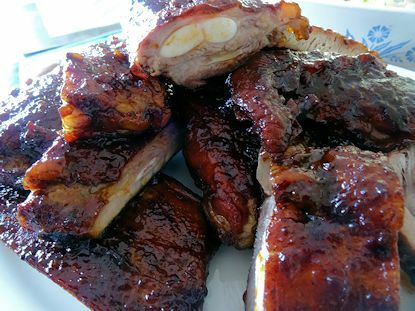 This post is how I made the Sriracha Barbecue Sauce. The Haskap Barbecue Sauce and the cooking of the ribs will be in subsequent posts. The recipe for this sauce is at the end of the post. I started by chopping the onion and garlic. Then I heated the vegetable oil in a saucepan over medium heat. Then I added the onion to the oil and cooked for about 4 minutes until the onion started to soften. I added the garlic, chili powder and cayenne and cooked for another 30 seconds. I added the remaining ingredients and brought the sauce to a boil. I reduced the heat and simmered for 5 minutes stirring frequently. Let the sauce cool and store in the refrigerator for up to 2 weeks. This is a nice standard barbecue sauce with a bit of bite from the Sriracha. It has great sweet notes, some tart and cooks down well on ribs. Add the onions and cook until softened, about 4 minutes. Add the garlic, chili powder and cayenne. Reduce heat and simmer for 5 minutes, stirring frequently. Cool and refrigerate for up to 2 weeks. OOH!!! Sriracha! I love anything Sriracha! Definitely going to try your barbecue sauce! Thanks! I do like Sriracha. I went a little light on the Sriracha in this sauce as it is layered on in cooking and intensifies. If you plan on using it as a stand alone sauce on the table, you might want to add more Sriracha. It is a steak sauce that originated in England and is common in Canada. Just substitute your favourite savoury steak sauce. Thanks David-tried the sauce on the weekend. Very good!